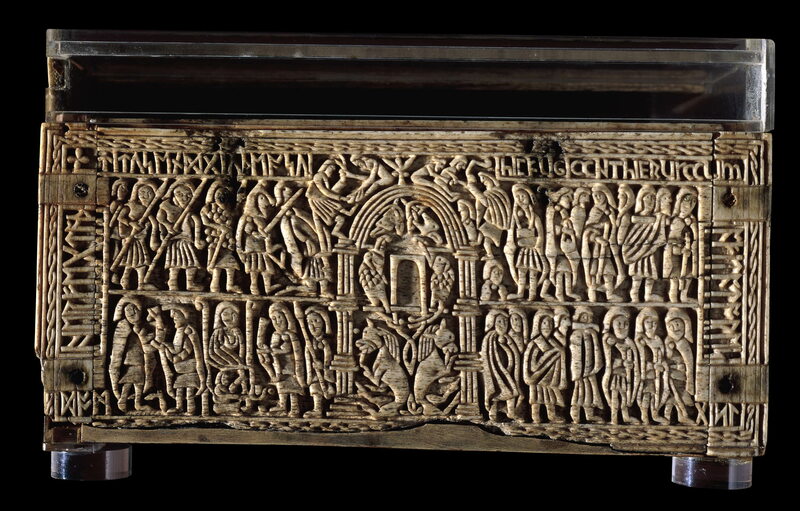 This Anglo-Saxon casket is covered with scenes from Jewish, Christian, German and Classical mythology and history and provides one of the earliest examples of a medieval depiction of the fall of Jerusalem—in this instance, its fall to the Romans in 70 CE. On the back of the casket, Titus’ attack on the city is carved out to dramatic effect. The whole panel is densely populated, with Roman soldiers on the left and fleeing Jewish inhabitants of the city under siege on the right. In the centre of the work is the Jerusalem Temple, with the Ark of the Covenant within it. The inscription on this part of the casket reads: ‘Here Titus and a Jew fight: here its inhabitants flee Jerusalem’. For an eighth century CE Christian artist, the fall of Jerusalem signified the end of the Jewish era and the beginning of a superior Christian Empire. This would have been particularly resonant in Anglo-Saxon England, which had only very recently been converted to Christianity.